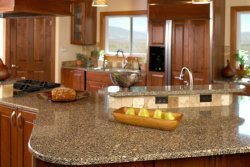 We offer the major types of kitchen countertops on the market today; they are briefly described below. As with all of our products, our designers will help you choose the countertops that are right for you. Granite countertops are created by nature and fashioned by modern technology. They are an investment that homeowners will never regret. With vibrant colors and a multitude of patterns, granite offers that elusive, one-of-a-kind beauty created only by nature. 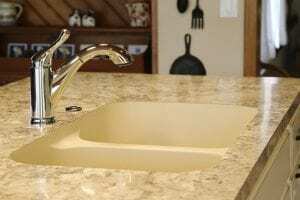 These countertops add character and warmth to your home in a way that cannot be duplicated with synthetic materials, yet they resist scratches and are easily sealed to resist stains. Prices have dropped dramatically in recent years, making them affordable for most kitchens. Technology has greatly improved laminate countertops over the past decade, making them a good choice for a budget-friendly countertop. Today’s laminates are made using high-resolution photography and high-tech printing techniques on advanced coatings to produce a surface that is strikingly realistic. They are also easy to clean and durable. We offer an optional integrated sink in stainless steel or acrylic. Quartz countertops, also called engineered stone, are made by combining quartz with resin and pigments to form slabs of countertop material. They are available in a wide range of stunning colors and patterns which are quite consistent from sheet to sheet, resulting in a uniform, predictable look over the entire surface. 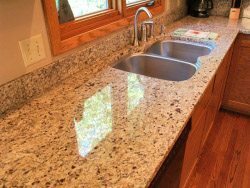 These man-made countertops have properties similar to granite, such as heat, scratch, and chemical resistance. They also have a non-porous, stain-resistant surface. Unlike granite, they never need to be sealed.